[FROM THE FORWARD.] 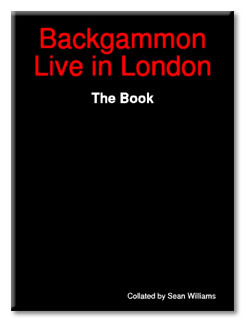 "This book is a celebration of Backgammon Live in Londonan annual event run by Michael Main which brings together people from all around the word to talk, drink, dance, laugh and play backgammon. Backgammon Live in London is an eclectic mix of novice players and seasoned pros, people for whom the game is a light diversion and people for whom the game is a life's study. This book aims to reflect the diverse nature of the event and its participants. This book has been put together on a shoestring by passionate amateurs rather than professional publishers. Please forgive the occasional type." A newcomer's perspective on the tournament by Michael Williams.